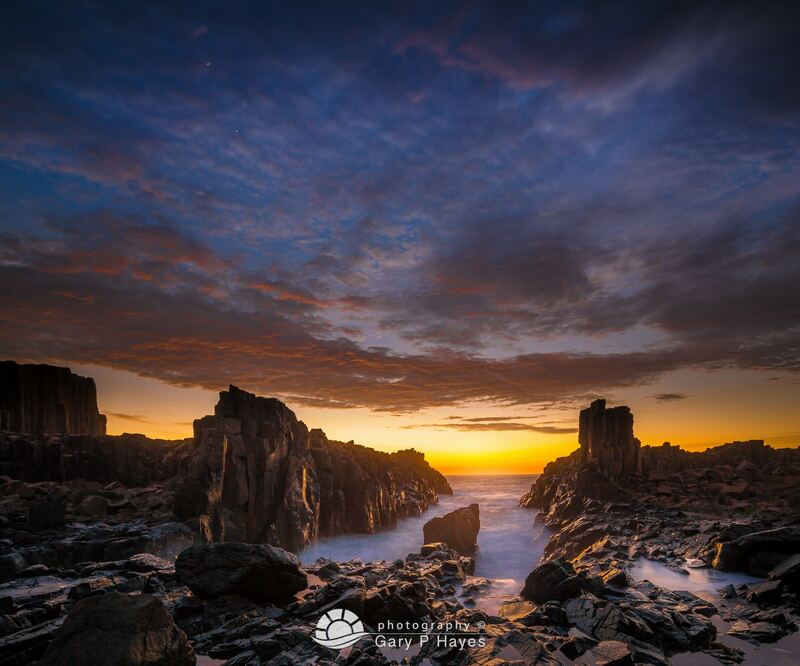 You don’t get many dawns like this, an incredible photographic moment at a surreal basalt pillar headland north of Kiama on New South Wales Central Coast. 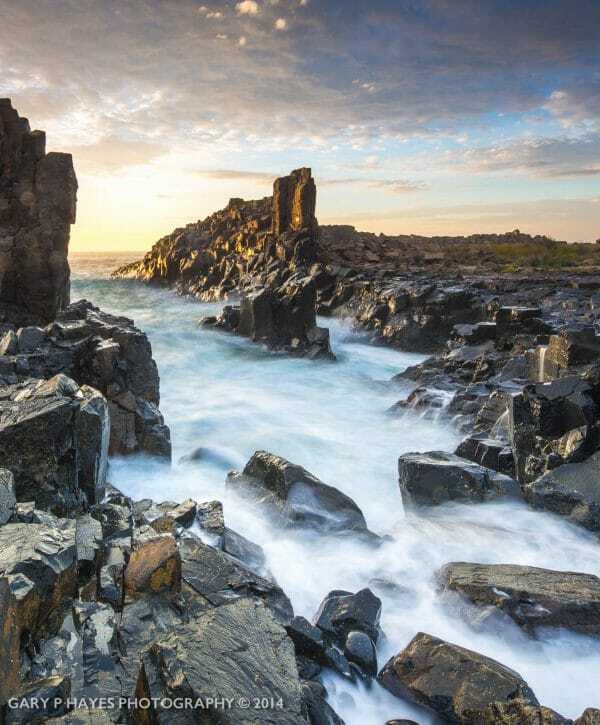 This is Bombo Quarry. This post is a little about my approach that morning, what was going through my mind as the scene developed and some detail on the location and technical elements. To set the scene here is one of the 80 plus long exposure shots I took using the Canon 5D3 and 17mm TSE lens. I was lucky to be staying in Kiama just south of Wollongong for two nights as I had a half day in Canberra, about an hour and half drive away. This gave me a couple of rushed sunsets, and two relatively relaxed sunrises. Living in the Blue Mountains I had researched several obvious locations and Cathedral Rocks and Bombo Quarry were the main games in town. 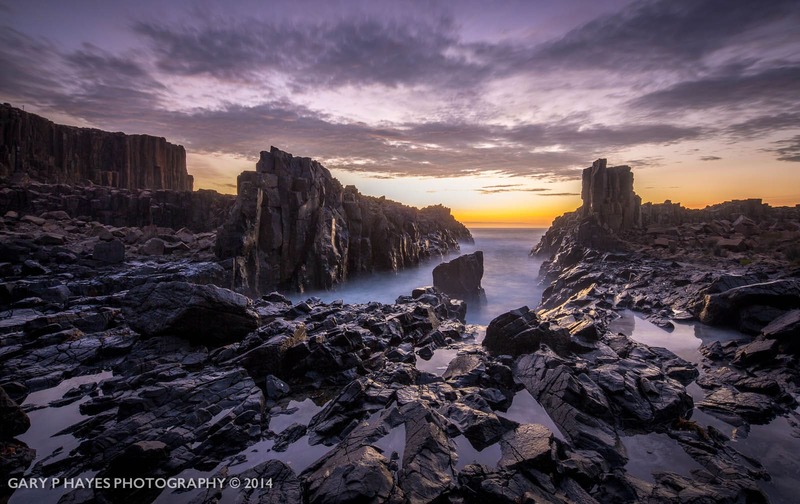 Both well photographed by many but Bombo Quarry seemed a little more enigmatic, the images from there seemed to favour only one location, even though the area was quite large and varied – compared to the rather limited Cathedral Rocks. The weather for both days was forecast as erratic with storms and lots of cloud cover. 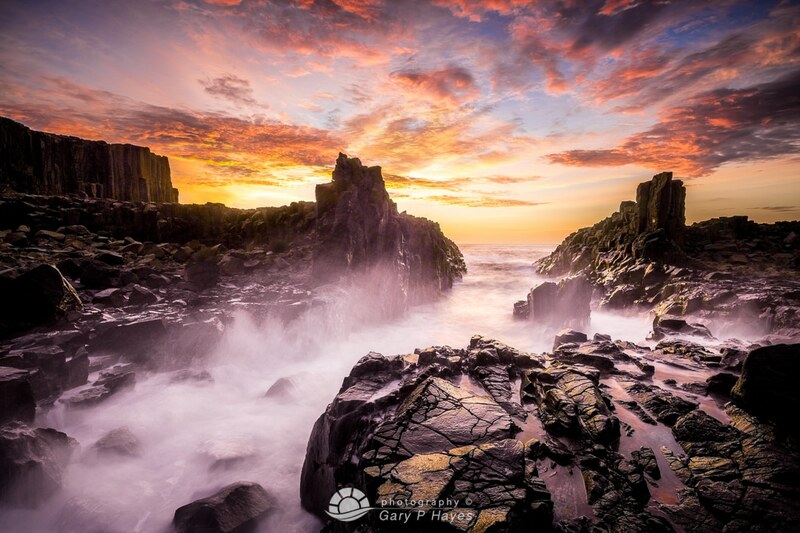 Added to this I had to deal with high tide at both sunsets and sunrises, which meant Cathedral Rocks was going to be tough to get to and Bombo probably a little dangerous. 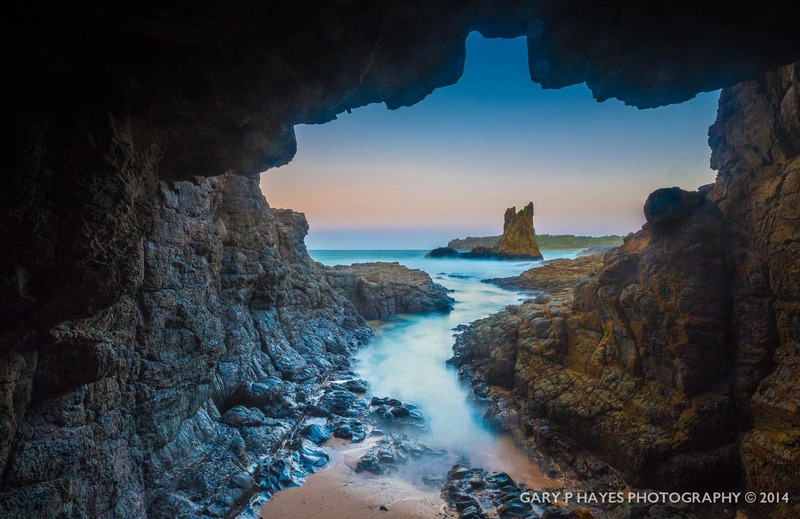 I had popped down to Cathedral Rocks the evening a few minutes after we arrived and, faced with a flat blue sky, a light fading inland and having to climb over a headland on a ledge 20ft above a lively ocean, I had only about 30 minutes to get a few opening shots. Several of these taken from a sinking sandy beach and this one inside the famous yet tiny ‘batman’ mossie cave, are shown below. Not quite what I had in mind, but it was only a reccy. Even so I was a little disappointed and looked forward to sunrise here tomorrow, which never happened. 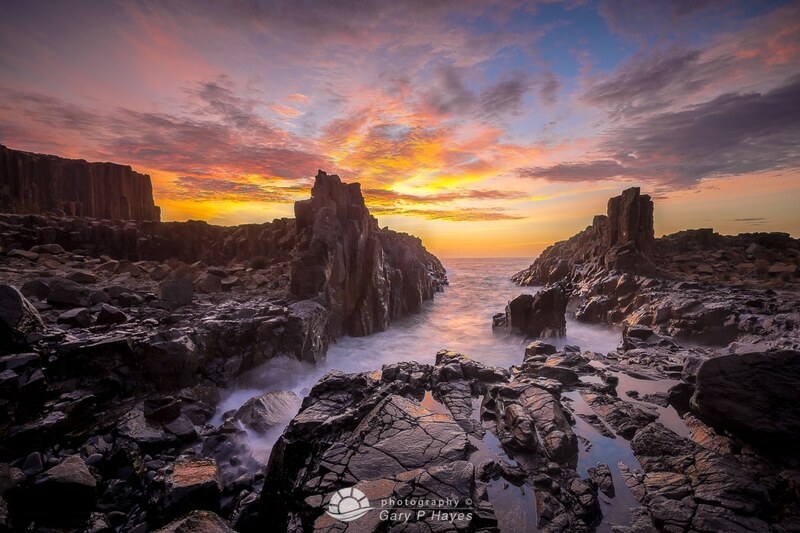 I had actually set out at around 5am to go to Cathedral Rocks again (about 15 mins drive from Kiama), but on a whim and the fact I didn’t fancy clambering over slippy, rocky ledges in the dark with all my gear, I turned off early to Bombo Quarry 10 minutes away. I had never been there but saw the beach car park on the map, and knew I would then have to do a 20-30 minute walk in pitch black. At around 5.15am I parked, put my head-lamp on and with Galaxy note GPS with google maps headed out to the far inlet (whatever that was) on the map. I thought the small channel shown on the map was the best place to start then work my way back as the light changed. I didn’t realise until later that this area is much less photographed, and I think I found out why. Walking in the pitch black on trails you have never been on before going to an unknown location is not normal for me, I usually reccy first and should have done the night before, but time then was short. I took a few wrong turns, a few edge of cliff dead ends, all the time the sea crashing around me and adding to the foreboding and excitement. The final part of the walk was in dim but increasing light, still using my headlamp to walk across small pools and quite large boulders. I heard the sea thumping occasionally and in the dawn light found myself finally next at the end of the channel on the map – the sea rushing in and crashing with such force that I knew safety would be a key issue here. I set up my camera gear about 25 ft from the channel. Putting on my 5 stop neutral density 145mm Wonderpana filter, screwed into a dedicated holder on my 17mm Canon shift/tilt lens (on a Canon 5D mkIII) and slotted in my 3 stop grad neutral density on the same holder. A nice system and once slotted onto the front of my 17mm, I could trust and forget it. By now I could barely make out the outlines of some amazing rocks around me, the sea about 70m away at the mouth of the channel and a raging torrent coming down the inlet, crashing on rocks on each side and one monolith rock in the middle. I carefully positioned myself on the south side of the inlet at first and composed for leading lines and good views of the mouth, and almost immediately, things got really interesting in the sky. Out of nowhere, fragmented clouds started to light up above me in the 20 minutes of pre-sunrise. This is normal for most coastal photographers, but is a rarer event in the mountains where distant coastal cloud banks often mean the mountains don’t get much pre-sunrise colour (well 1 day out of 7 or so). I started to fire off a range of 10-25 second long exposure shots in this still very dim light. The sky before sun-up, around 5.45am was a mix of deep purple ambience, reds higher up and yellows on the dawn horizon. This reflected off the black shiny rocks around. I tried to feature the rock in the middle of the channel, the upright monolith on the right of the mouth and the big walls in the distance, on the upper left of most frames. It was a very special moment as the sky and land began to light up. This gradual rise in light from dark to surreal revealed an alien-like world, is a moment to be shared but also coveted as a solitary experience. Both work. This morning I was the only person on Bombo Headland. I didn’t see another soul until two hours later. The large 6×8 inch filter on the front of the camera is great for keeping spray off the lens but it is so large it even protects the 5D3 camera itself! This shot and several around it was particularly spray inducing. Sunrise brought a completely new feel to the place and the clouds were still performing, going from deep purples to oranges and reds, I found wonderful reflections in lots of rock pools, the filter combination was perfect and I didn’t really need to do any blending, I did do a blend on one shot in a group of 30+ separate compositions from this shoot. The others I just shot for the highlights, carefully noting any blowouts on the camera (zebras) and lifted the shadows slightly in post processing. I already knew how they would turn out, as I looked at the scene in real life, after the first few shots. I had to adjust settings slightly of course when the sun started to reflect off the ocean and the rocks in the distance, but overall the balance of rocks, sea and sky, all very controlled on this session. Here is a shot just as the sun popped over the horizon and started to light up the rocks on the right and create a few highlights in the clouds. I was probably at this small location from 5.45 to 7.15 or so. When the sun was higher up it luckily went behind those lovely clouds, so I was able to start to do some handheld shots. I packed up the tripod and filters, and with 5D3 went into walk mode with my 35mm Zeiss lens. I got closer to some of the edges, carefully watching wave height but…on one occasion the sea decided to let me know who was still boss and hit me with a 6 ft high spray from head to toe. I had managed to turn side on and protect the camera, but still, it made the next hour slightly sploshy. It is good to have those lessons to keep you on your toes. The light stayed useful for the next hour. To the immediate right of the inlet, this great wall of basalt towers (often photographed from the other side as the sea hits them) had some great textures and interesting reflections of the whiter sky and I did a few handheld 9 shot panorama of the scene – easily stitched as I was using a 35mm lens. The rest of the shots were of rock pool reflections and a few edge of rock views out to sea, until I found myself at the ‘other’ end of the headland and came on by accident the ‘standard’ perch where many take shots of the sea hitting the basalt wall. The sea, by now had settled quite a bit and the wind dropped with the sun at it’s 8.15 am position or so – plus I had a drive to Canberra to make at around 9am to get there for midday. So managed to take about five quick shots from this, nearer the car park position. 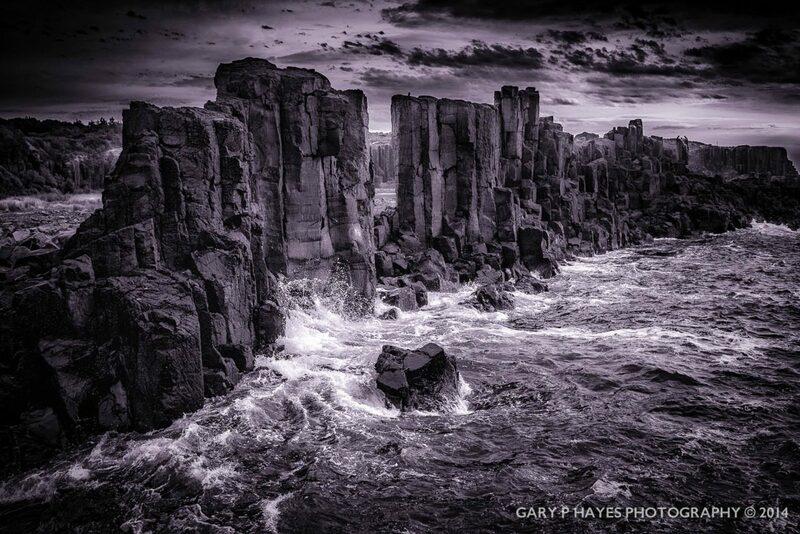 Here is a black and white treatment of one of those… a shame as probably 15 minutes earlier I had seen very large waves from the cliffs looking the other way. I think I sub-consciously gave it a purple, mono treatment to reflect the pre-sunrise shots earlier on. It still has something about it, and the clouds as you can see, are still adding sky interest. OK not exactly a 3 day trek over mountains or through thick bush to get that ‘one’ shot (I have done those and will do more) – but this was, all in all an amazing morning here. It really doesn’t matter if I stumbled in the dark for 30 minutes, fell into the ocean, walked 100 miles, had to traverse rivers, I got some images that mean a lot to me and others. Back at base the first thing, backup time, especially if you are immediately busy on some other work after this sort of shoot. A quick backup of the card, copying shots onto my laptop for safety, and looked forward to processing later. But I couldn’t resist and managed to prepare a few images before I set off, just for my own sanity. Did I really see what I saw/felt? Am I creating higher expectations of something that didn’t really happen? Are these really special and did I mess up anywhere? All part of a landscape photographers angst, pre and post shoot. I was overjoyed with the images. All of them had some subtle differences and individuality with a constant changing light over 90 minutes or so. I was lucky that morning. Alone, with no real knowledge of the area and effectively on a reccy, the natural elements were with me and technically things came together. Lots of lessons, the main one being, sometimes you just have to trust that the situation will work out and have faith, that good things will happen. The sunset that evening and next sunrise were overcast, drizzly, no colour and rather dull in comparison. But that didn’t matter when you remember the day before and think of days to come. For those thinking of going here themselves, highly recommended and I wish you good safe weather and good skies. Google map embed below and on all the 500px images above. Thanks Pip – very kind and hope you get some great shots! Hi Gary, I am trying to add this and your mountains page to my pinterest photography reference folder. Both are coming up with the picture as being too small. I dont normally have this problem. Excellent…another gem…Thank you Gary..must see this one ! 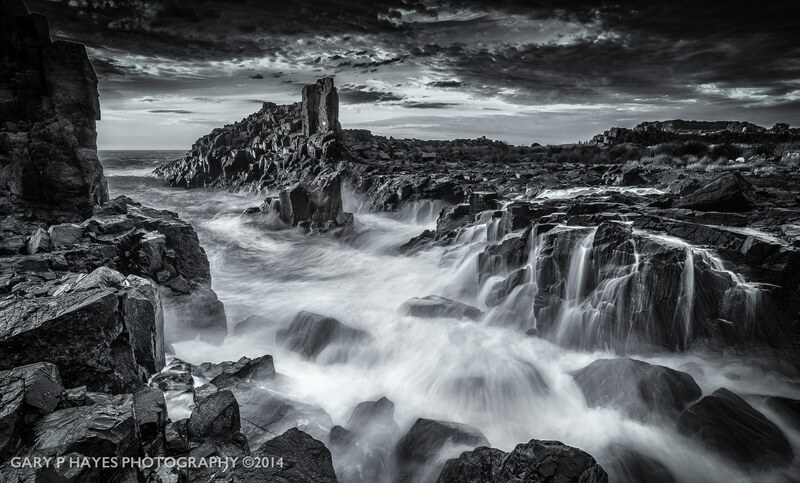 Bombo quarry is an amazing location and so many composition choices. Another that you could try is at the far northern end up on a shelf but it is tricky to get up there with gear. Try 10 stop long exposures as well. I can’t mention enough that it is a really tricky location to navigate especially in the dark. The myriad of small rocks can be slippery and deceptively unstable – as I found out to my detriment by taking a fall – but the camera was ok! Good hiking boots are recommended rather than rock fishing boots/cleats. Hi are any of these prints available to buy?